Democracy is being threatened, says Benjamin Barber, by a rampant, homogenizing, valueless capitalism (McWorld) on one hand and by fragmenting, fundamentalist ideologies (Jihad) on the other. 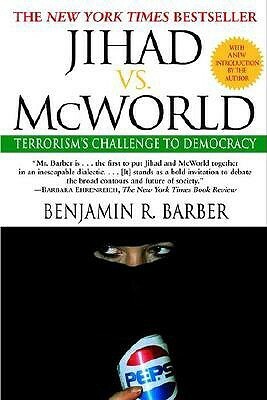 BENJAMIN R. BARBER, JIHAD VS. MCWORLD: How THE PLANET IS BOTH FALLING APART AND. COMING TOGETHER AND WHAT THIS MEANS FOR DEMOCRACY (1995). This book elaborates a thesis Barber first introduced in an article in The Atlantic and which he further explored in a previous edition of this.